We ended up traveling thorough Idaho to get from Yellowstone to the Oregon coast. 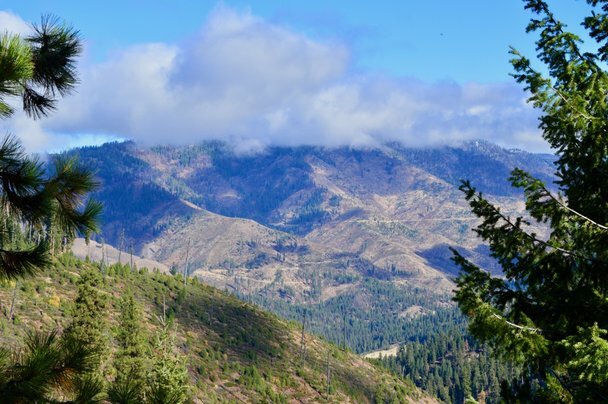 However, once we started researching places to visit and began driving we were really impressed by the scenery and all that Idaho has to offer, especially for the outdoor enthusiast. Don’t stay on the highways, do the Idaho Scenic Byways! 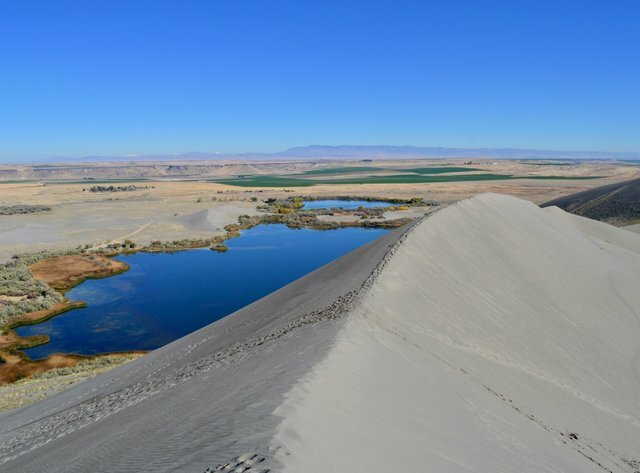 There are lots of potatoes (which is what Idaho is known for), but so much more to see including vast forests, mountain ranges and even desert and sand dunes. After Yellowstone National Park we headed to the closest center in Idaho, Idaho Falls. We decided it was time for a hot shower and water fill up so we stayed at a local campground right in the city. Unlimited free hot showers, open 24 hours and free Wi-Fi! We even got some laundry done! This was a nice reset after our first week on the road stopping at free campsites which consequently meant no running water. After Idaho Falls we continued to Blackfoot, home of the Potato Museum! Did we actually go to a potato museum? Yes, we did, and you know what, it was actually surprisingly interesting. Fun fact: the average American each 142.7 lbs of potatoes each year! We even got a free box of hash browns at the end and they had a potato café which served delicious baked potatoes. As a potato lover I was sold. 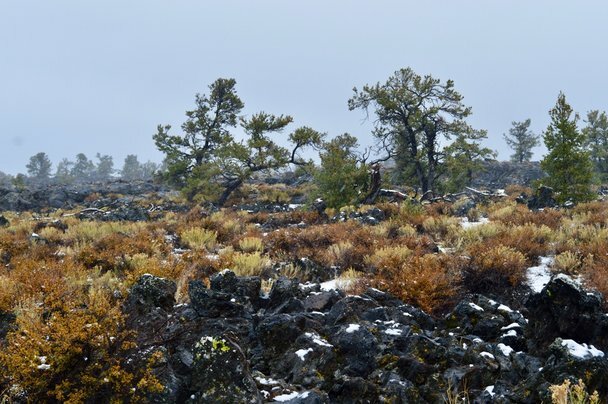 Our next stop was Craters of the Moon National Monument, this area has volcanic features and is a series of lava fields. Unfortunately, the weather didn’t cooperate and we had snow and white out conditions. Maybe this is what the moon really does look like? From what we could tell the topography was pretty unique and definitely not something I would have associated with Idaho. We planned to stay close to Craters of the Moon, however due to inclement weather we kept driving and ended up just outside of Sun Valley and the town of Ketchum. Ketchum is a ski resort town which over the years has attracted famous guests and was one of the first places to have an automatic chair lift. 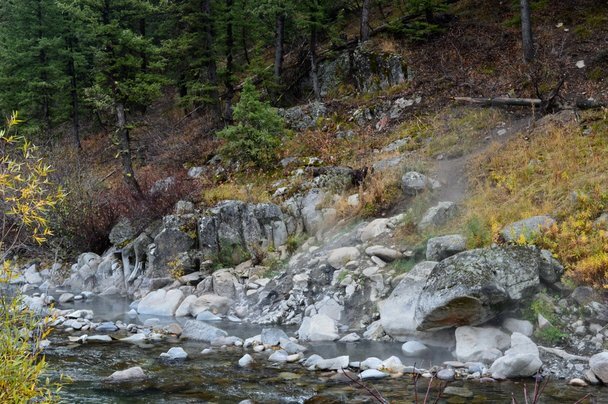 We camped near Ketchum and we were also conveniently by Frenchman’s Bend Hot Spring. 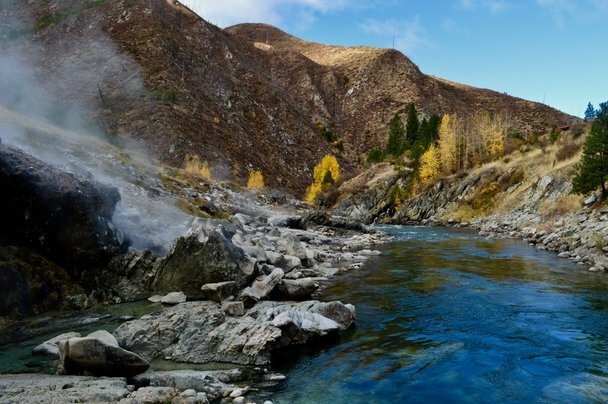 We actually happened across two hot springs (Frenchman’s Bend and Kirkham), both free and non-commercialized so you could literally just pull over and hop in! We went in the Frenchman’s Bend Hot Springs and it was amazing and we had it all to ourselves (bonus: there was a nearby tree for Roo to be tethered too)! I think both spots are fairly well known but due to the time of year we had it all to ourselves. One of the highlights of our time in Idaho was the Burdeau Sand Dunes. It was warmer weather and both Mitchell and I hadn’t visited anything like this before. 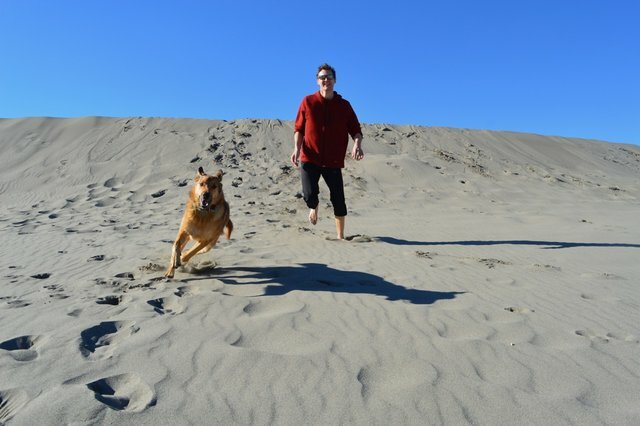 We were able to hike with Roo up a few different sand dunes and she was very excited, Roo loves all things sand and gravel and if she can chase it as it slides down a slope even better. She was thrilled. When camped outside of the sand dunes we also learnt about bugs, mostly flies and had to do some strategizing to minimize the number of bugs that made their way in our sleeping area. This is difficult when you cook off the back of your truck and you also sleep in the back of your truck. Our stand alone tent works out as a nice option when you need a bug free space away from where you plan to sleep. Our biggest defence against flies however turned out to be Roo, she is a mean-keen fly killing machine. It went like this: I shine the flashlight on a group of flies, they move, Roo locks in and then does wild snapping in the air, all with impressive accuracy. To be fair, these did seem like slower flies, maybe their lifespans were almost up? Our last stop in Idaho was Boise and we stopped at Payette Brewing company on our way through. They allowed dogs in their tap room and had free Wi-Fi, what more could you want? Idaho was a great surprise and we recommend making the trip if you ever get the chance! Great sand dune action shot of Roo and Mitchell!